Even in this most complex of sport's some things make absolute sense. Lewis Hamilton's new hairstyle on show in Monza may be described as loud but everything else about him out of the car has been understated. His prose clipped to the point of paucity. His voice hushed. But his content with the quiet has been unmistakable. He has by now more than a race win over his habitual nearest challenger team mate Nico Rosberg in the points table, and this weekend in Monza's royal park has been mere continuation. Looking the fastest thing out there in a very fast Mercedes - which has had another wind with gleeful consumption of its remaining engine development tokens for the year - from the moment a wheel was turned on Friday. Looking utterly in control and extremely quick. 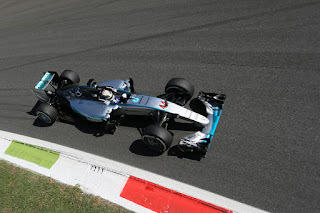 Sure enough he claimed an imperious and untroubled pole position for the Italian Grand Prix. There were though a couple of deviations around him. Nico did appear for a time that he might play the role of irritant but Lewis then had some luck you suspect he didn't really need. Nico was required to abandon his upgraded engine for a rather long in the tooth old unit after problems in Saturday morning practice. That consigned him to proceed with anchors on, and down in the speed traps he could only salvage fourth on the grid. But there was another surprise in qualifying, in that the home team of Ferrari came alive after a difficult Spa weekend and a low profile Friday here. Of course Ferrari coming alive in Monza against all odds is nothing new - indeed it has something of the soothing throwback about it, and they got within about a quarter of a second of Lewis's best - much closer than anticipated - and will fill the next two places on the starting grid. Both Scuderia drivers spoke of surprise at their competitiveness, but it transpired later that all at Ferrari had been rather coy. 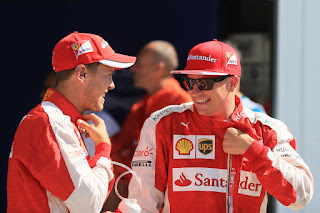 It had itself spent four of its power unit upgrade tokens (more than the 'couple' Maurizio Arrivabene had indicated in the Friday teams' press conference) and clearly it's given the red cars a boost. With soft tyres bolted on for quali it got a further one. In an auxiliary surprise this time Kimi Raikkonen was the lead of the two Italian cars and will start the Monza race from the front row. Given his well-known quali modesty he quipped that it would be his first front row start for "eight, ten years probably". It's actually is his first since China in 2013 but we got the point. Even the tifosi were a bit slow on the uptake, as in Q2 when the presumptive lead Sebastian Vettel swept around to claim P2 at the time the pit straight crowd roared its approval both in its anticipation and its achievement. Then seconds later when Kimi came by and took the place for himself it seemed to take them a while to notice. But still, the Finn's performance was another thing that had something of the throwback about it. But the boost only took Ferrari so far. You never suspected it would get them all the way to the mountain top, as that had been claimed in advance. 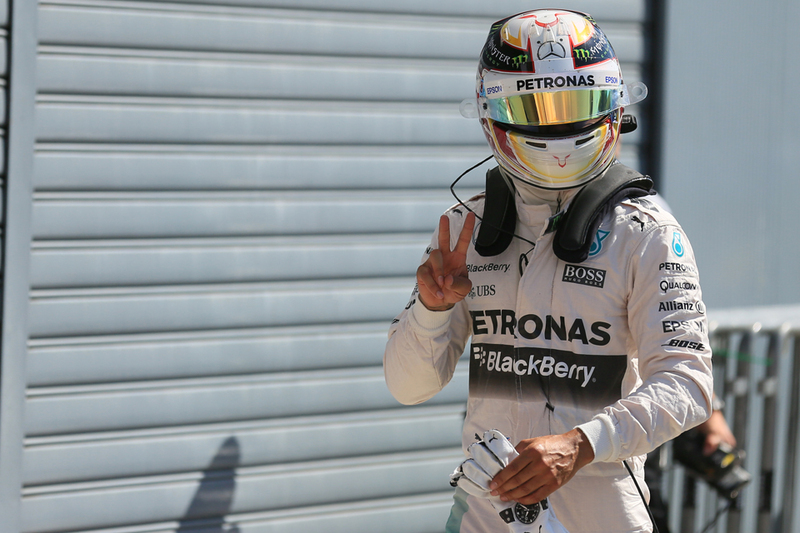 Underlining the point a little more thickly Lewis's pole was his seventh on the spin. And it was magnificent. No one is denying who is the firm favourite for the race either. Not even the usually Tigger-like Vettel. "[Ferrari winning] would obviously be a dream coming true" he said. "I think dreaming is allowed but nevertheless you have to be realistic. I think it's going to be tough tomorrow. These guys [Mercedes] have some serious pace in the race, as we've found out many times this year". Even Lewis later let on that he felt there was more time to be had; that his final qualifying advantage could have been more decisive. Plus the feeling around is that the Mercs' advantage will be greater in the race; their race pace was strong in practice, Lewis said he in fact prefers the medium tyre to the soft plus the Ferraris it is thought will be required to turn their engines down. 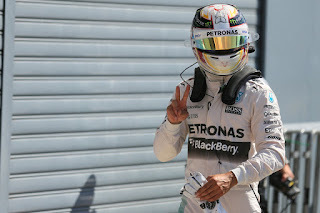 Nico therefore thought that he "for sure" had a chance to attack the Ferraris in the race. As for Lewis? That will be "more difficult". Yet it may not be so simple. It's a long drag to turn one from the off, the Ferraris' starts have been good lately and the Mercs' not, plus we only have to go back two rounds to Hungary to find a Lewis Hamilton and Mercedes looking even more predominant at this point of the weekend only for places lost off the line to herald a severe and rapid unravelling and an imperious Ferrari performance. 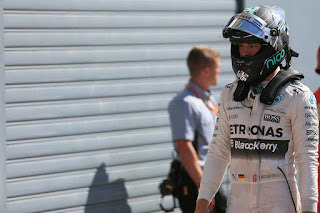 There was another note of worry in the Lewis Hamilton parade on Saturday evening in that same stroke of fortune mentioned, in that Merc boss Toto Wolff admitted for a time that the team "simply don't know what the root cause" of Nico's engine problem was, and that "there is still a big question mark about what's actually happened and the potential risks for Lewis". He wouldn't rule out an engine change for the Englishman either. There was therefore relief around the silver team as this morning it was revealed that Nico's engine problem was down to a coolant leak, and that Lewis's unit shouldn't be at risk. Even with the worry though, there was little doubt who starts as favourite. After the silver and red cars there are a bunch of Mercedes customers who appear well served here. They have proceeded in a tight bunch all weekend and stayed that may in qualifying with only a couple of tenths covering the Williams, Lotuses and Force Indias in Q2. 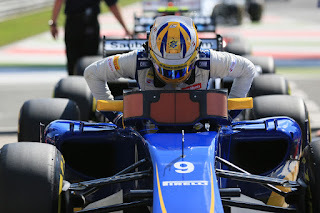 Kudos to the unlikely figure of Marcus Ericsson in the Sauber for breaking into this apparently exclusive party, as he got into the top ten although this was spoiled a little by him getting a three-place grid drop for impeding Nico Hulkenberg earlier. The Hulk himself had a curious end to the day by running out of fuel after his first Q3 run. Those with a Renault or worse a Honda engine have it seems effectively written off this Monza weekend with its long straights almost designed to make their lives difficult, every one of them taking new engines and the grid drops that go with them so to make the rest of their seasons - especially Singapore next up you suspect - more palatable. There are some prestigious people lining up at the back. Given the furious hand-wringing earlier in the year about engine penalties apparently being too harsh, in weekends like this one wherein teams instead happily gather penalties like sweeties for strategic reasons you are given cause to think that F1 in fact gets the regulations it deserves. There was some more leniency on show in Monza's qualifying as Max Verstappen will only face an early race drive through for an unsafe release at the end of Q1, when his engine cover flew off. Given that Max, perhaps impoliticly, admitted afterwards that the cover was only "50%" secured as the team was sending him out in a hurry at the end of that session following engine problems, and thinking of what could have happened, we can say that Toro Rosso got away with one here. In more ways than one perhaps. Far ahead though we have a Lewis Hamilton who all things being equal should be in a class of one. Only the unusual will be able to stop him. But there is at least one reason to think it might.